"The Columbia River Highway ... Dodson to Cascade Locks"
Click image to enlarge Eagle Creek Bridge, Oregon. Upstream side. Image taken September 16, 2006. 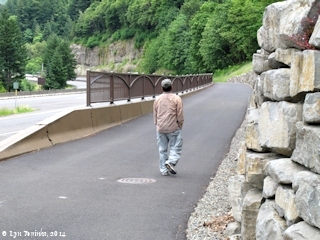 Hikers and bicyclists can travel portions of the old road path as part of the Historic Columbia River Highway State Trail. 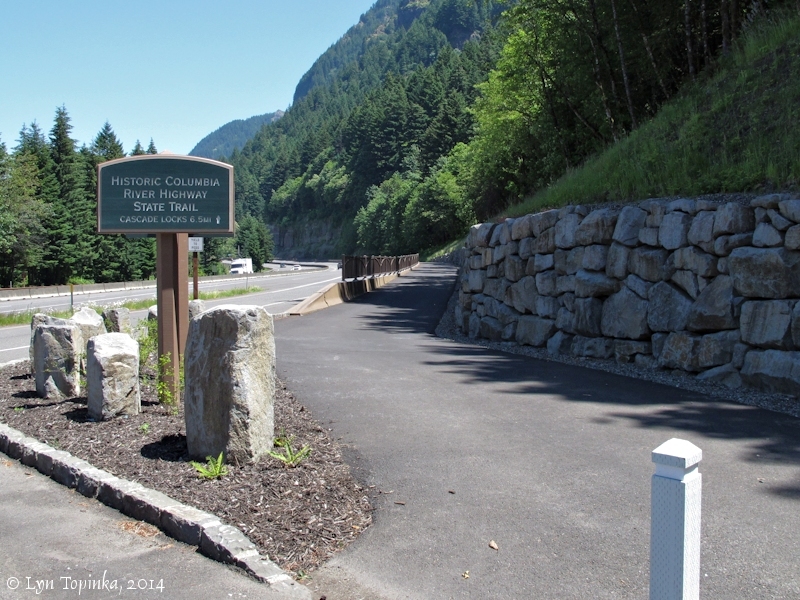 The west trailhead begins at Yeon State Park and the east trailhead is under the Bridge of the Gods in Cascade Locks. Travelers in cars enter Interstate 84 at Yeon State Park and drive east. Interstate 84 follows sections of the old Highway route, the Toothrock Tunnel still exists, and other sections can be had from side trips at Bonneville Dam (Tanner Creek) and Eagle Creek. Eventually exit to the Cascade Locks exit and head into town, rejoining the old route as you go. 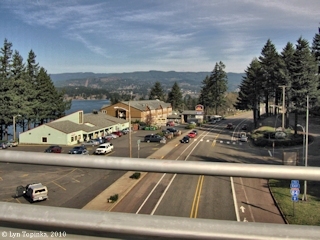 The Oregon community of Dodson is located at Columbia River Mile 140, Tumalt Creek at MP 140, and Warrendale is located at Columbia River Mile 141.5. 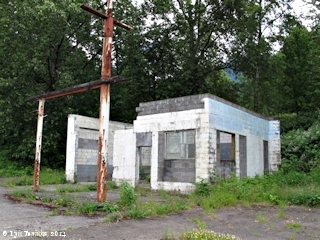 Click image to enlarge Abandoned Gas Station, Dodson, Oregon. Image taken June 9, 2014. 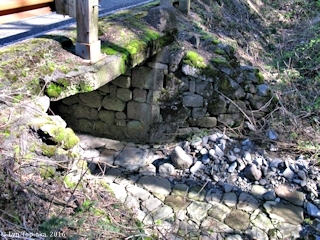 Click image to enlarge Culvert along Frontage Road, on the old HCRH, Dodson, Oregon. South side. Image taken March 17, 2016. 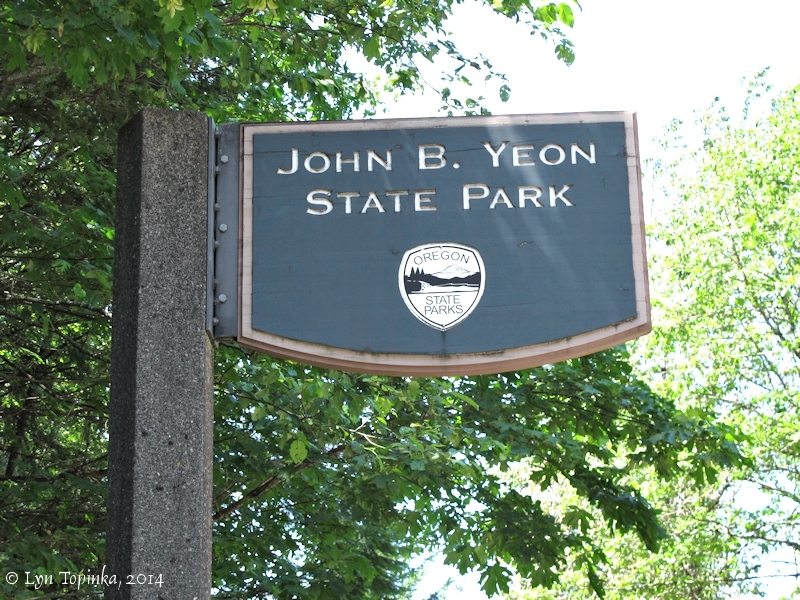 John B. Yeon State Park stretches approximately from Columbia River Miles (RM) 141 to 145. 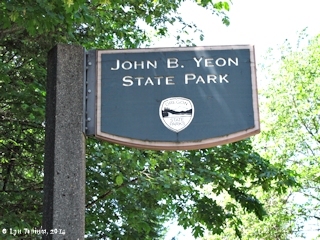 The park was named for John Baptiste Yeon who came to Oregon in 1885. Yeon was a "rags to riches" story, beginning his Oregon career as a logger, and ending it as a prominant Portland citizen. 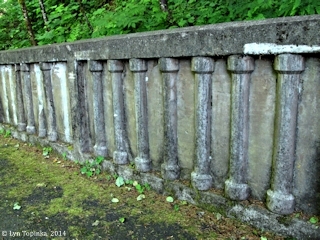 He was among those who promoted the Historic Columbia River Highway. Cars travelling the HCRH merge back onto Interstate 84 at Yeon State Park. Hikers and bicyclists however can continue east along the Historic Columbia River Highway State Trail. 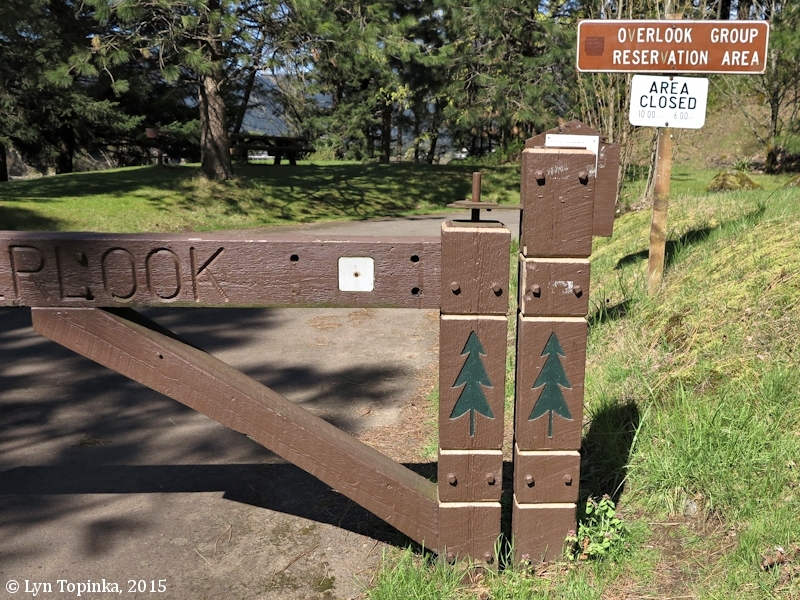 Click image to enlarge John B. Yeon State Park, Historic Columbia River Highway, Oregon. Image taken June 5, 2014. Click image to enlarge Trailhead, Elowah Falls, John B. Yeon State Park to Cascade Locks, Oregon. Image taken June 5, 2014. At Yeon State Park cars travelling the Historic Columbia River Highway can merge back onto Interstate 84. 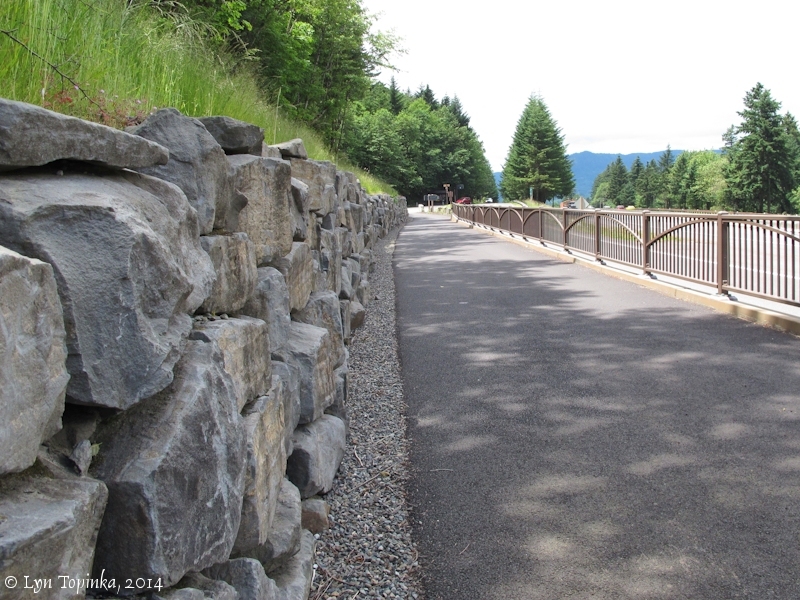 Hikers and bicyclists can continue east along the Historic Columbia River Highway State Trail. 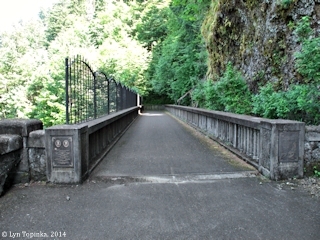 Click image to enlarge Historic Columbia River Highway State Trail at John B. Yeon State Park. View looking east. Image taken June 9, 2014. Click image to enlarge Historic Columbia River Highway State Trail, looking west, McCord Creek to John B. Yeon State Park. Image taken June 9, 2014. Cars travelling the Historic Columbia River Highway can merge back onto Interstate 84 at Yeon State Park while hikers and bicyclists can continue east along the Historic Columbia River Highway State Trail. 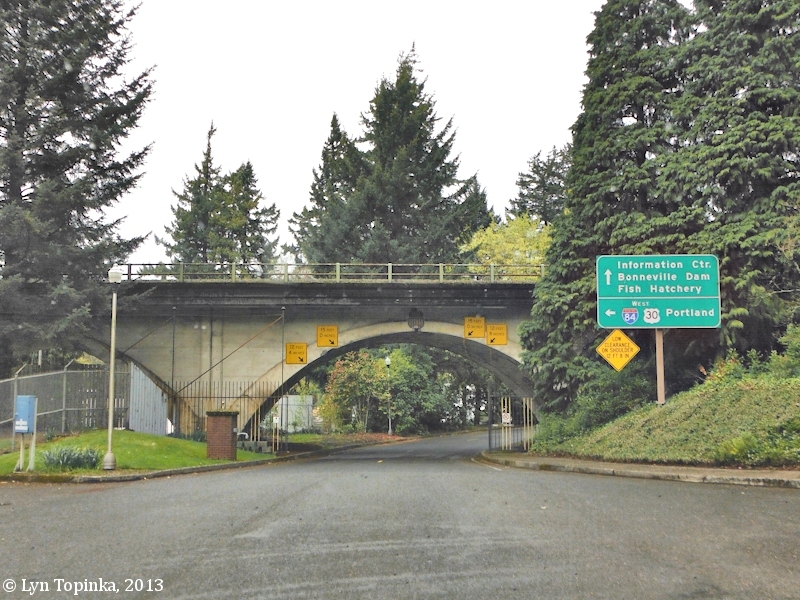 Click image to enlarge Historic Columbia River Highway junction with Interstate 84. Image taken June 5, 2014. 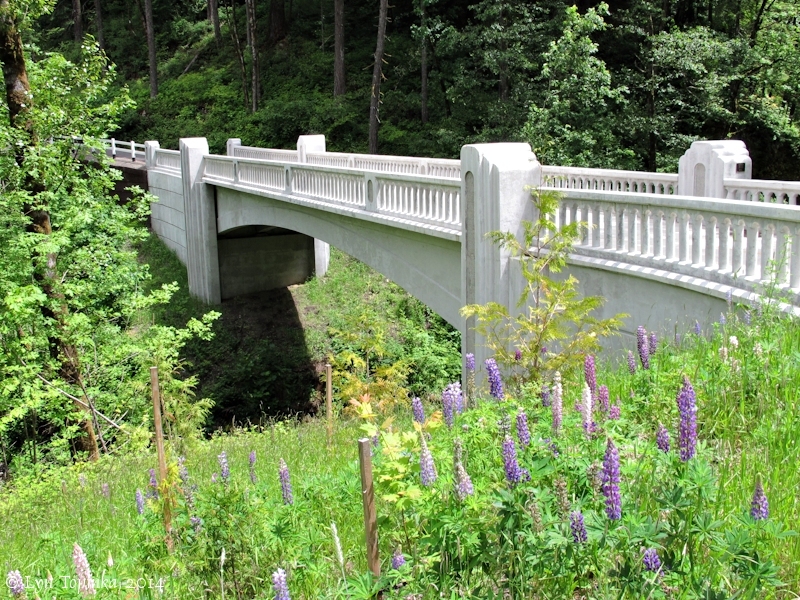 This new bridge over McCord Creek is now a part of the Historic Columbia River Highway State Trail. Click image to enlarge Moffett Creek and bridges, Oregon, as seen from Hamilton Island, Washington. Image taken April 2, 2005. 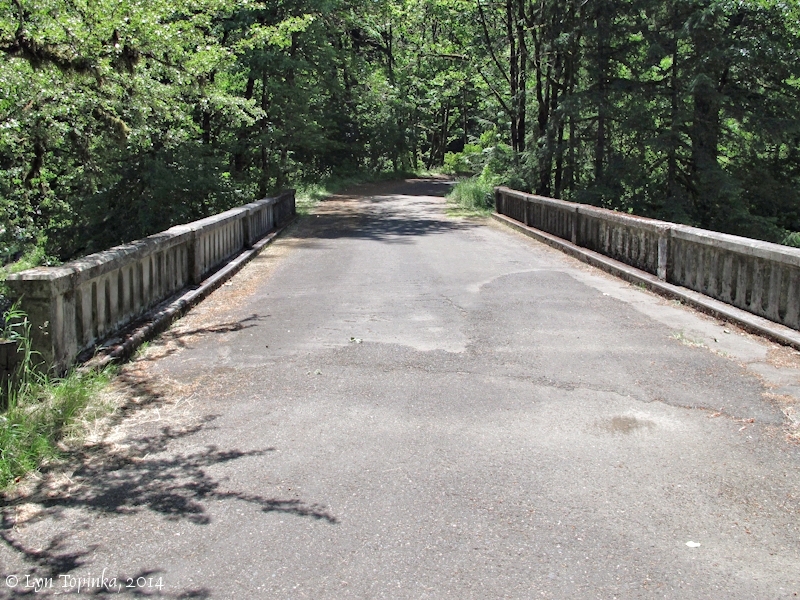 The Moffett Creek to Tanner Creek segment of the Historic Columbia River Highway State Trail is 1.3 miles long and crosses the original Tanner Creek HCRH bridge. 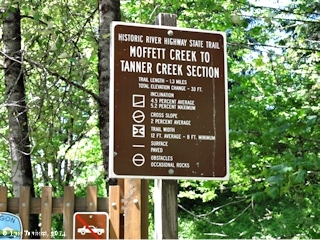 Click image to enlarge Sign, Historic Columbia River Highway State Trail, Moffett Creek to Tanner Creek. Image taken June 5, 2014. Tanner Creek, Oregon, merges with the Columbia River at River Mile (RM) 144, just downstream of Bonneville and the Bonneville Dam. 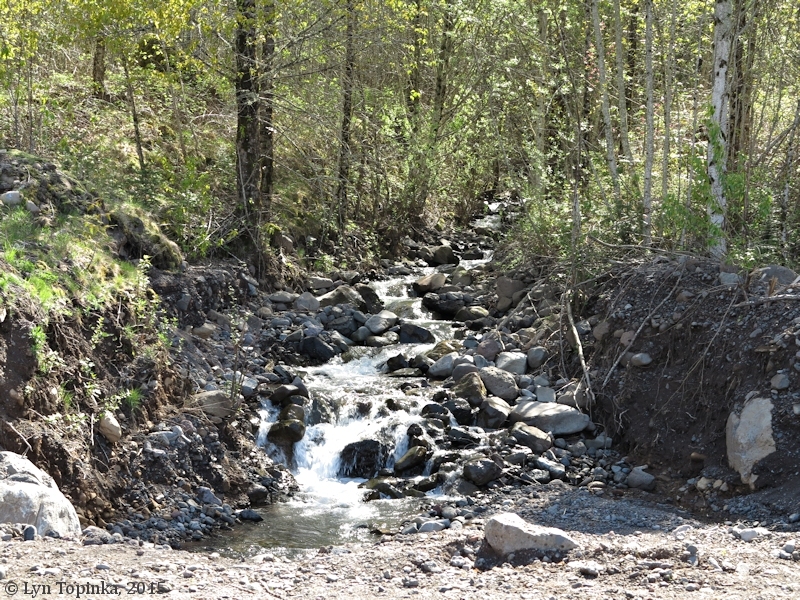 Since 1909 the waters of Tanner Creek, plus nine hatchery wells, have been used for the Bonneville Fish Hatchery to provide water for rearing fall chinook salmon, coho salmon, and summer and winter steelhead. Wahclella Falls, not quite a mile above the creek's mouth prevents fish passage beyond that point. Tanner Creek can be reached from the Bonneville Dam exit off of Interstate 84. 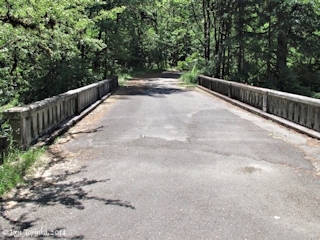 Click image to enlarge Historic Columbia River Highway bridge at Tanner Creek. View looking west. Image taken June 5, 2014. The Bonneville Dam is a hydroelectric dam built across three islands - Robins, Bradford, and Cascade and began producing power in 1938. Once known as the "Cascade Rapids", this area was a major obstacle to navigation on the Columbia. The Rapids were a result of the Bonneville Landslide, a massive landslide which gave rise to the legend of the Bridge of the Gods. Bonneville Dam is located at Columbia River Mile 146 and can be reached from Interstate 84. 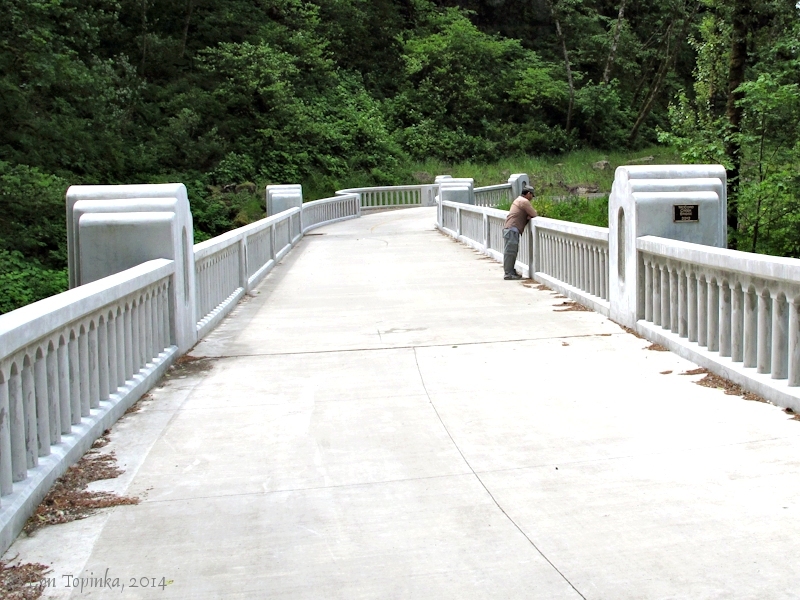 Views of the Dam can be seen from the Toothrock section of the HCRH State Trail and the Eagle Creek Overlook. 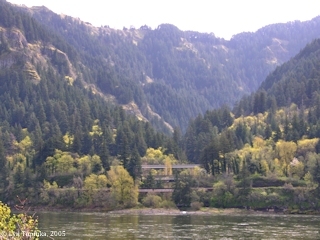 Click image to enlarge Entrance to Bonneville Dam from Interstate 84. The road from Interstate 84 into the Bonneville Dam complex passes under an arch of the Tanner Creek Viaduct. Image taken April 13, 2013. 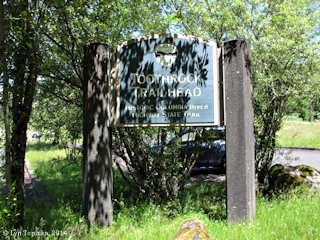 Click image to enlarge Toothrock Trailhead sign, Historic Columbia River Highway State Trail. Image taken June 5, 2014. Click image to enlarge HCRH State Trail near Toothrock, Historic Columbia River Highway State Trail. 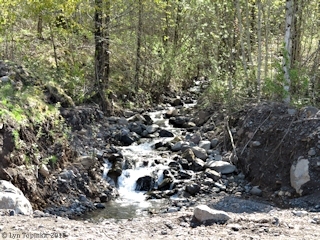 Image taken June 5, 2014. Click image to enlarge "Eagle's Nest", Historic Columbia River Highway State Trail near Tooth Rock. View looking northeast. Image taken June 5, 2014. 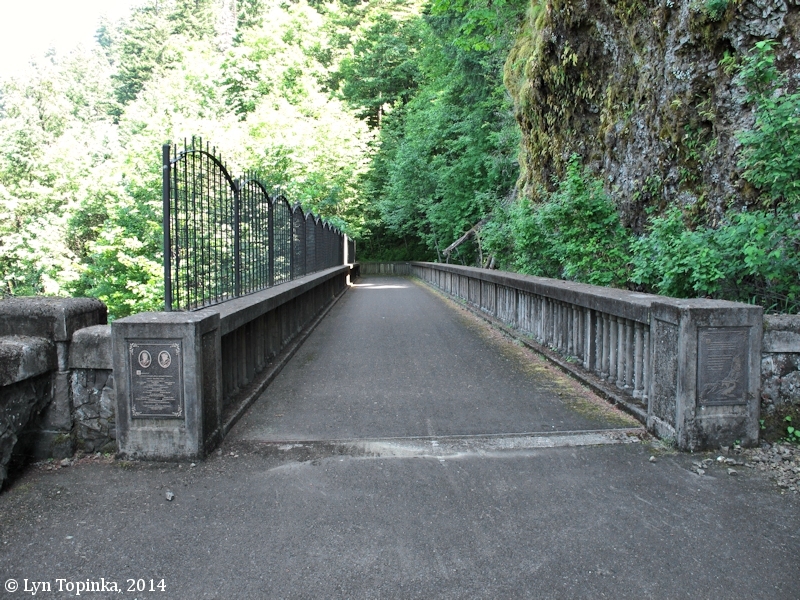 Click image to enlarge Toothrock Tunnel Bridge, Historic Columbia River Highway State Trail. Image taken June 5, 2014. 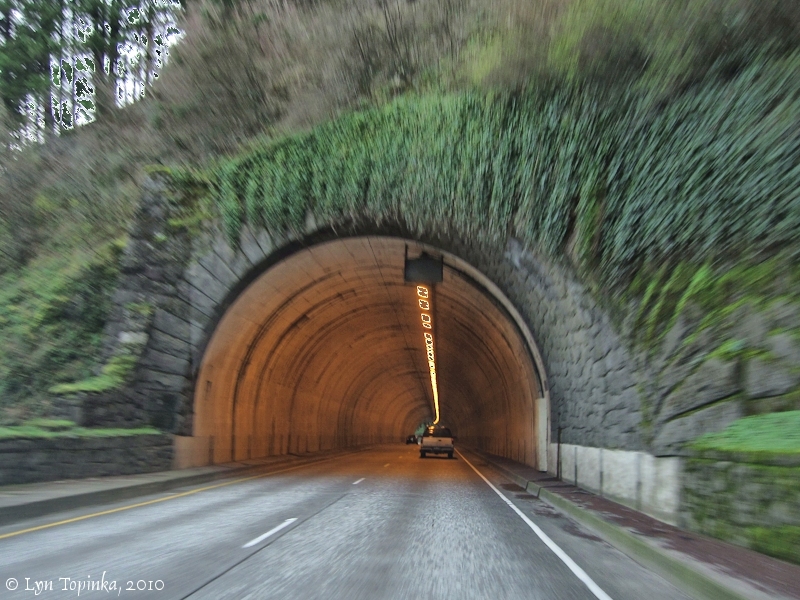 Click image to enlarge Toothrock Tunnel, Bonneville, Historic Columbia River Highway, Oregon. View from front window of moving car. Image taken March 6, 2010. 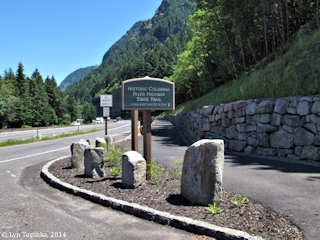 "In 1999, the FHWA's Western Federal Lands Highway Division completed rehabilitation of the 2.4-mile Eagle Creek to Cascade Locks section of the Columbia River Highway for non-motorized use. 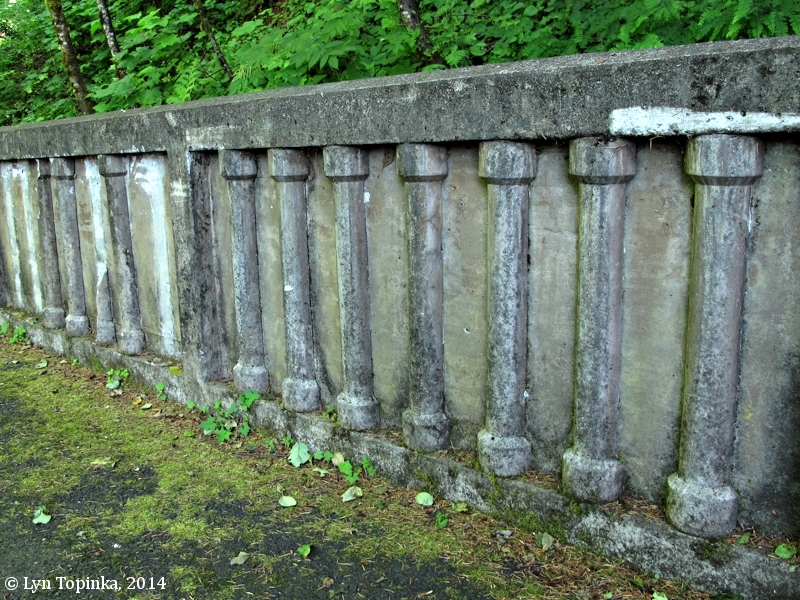 Within a quarter mile east of the Eagle Creek Campground, the hgihway's alignment headed south, away from the river. 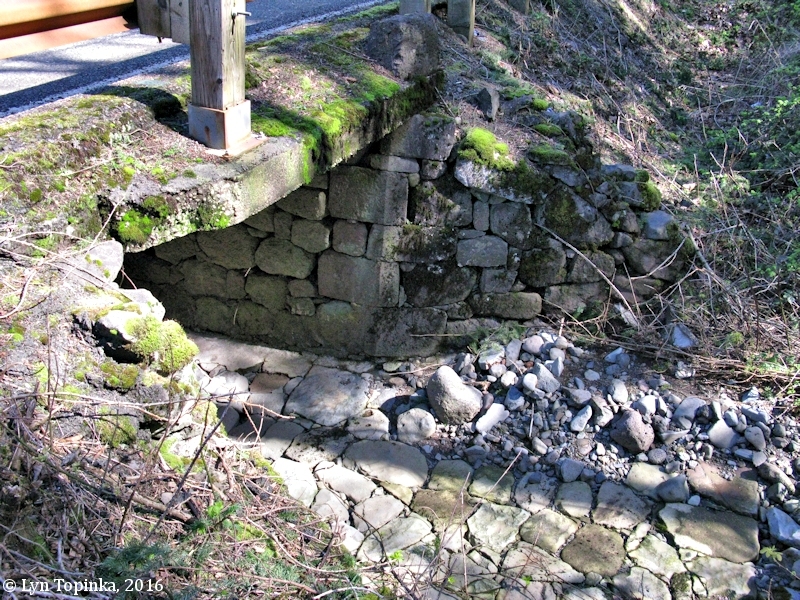 At HMP 43.6, it crosses Ruckel Creek on a masonry-walled 10-foot slab span constructed in 1917. Eagle Creek is located on the Oregon side of the Columbia River at River Mile (RM) 150, at the upstream end of the Bonneville Dam. 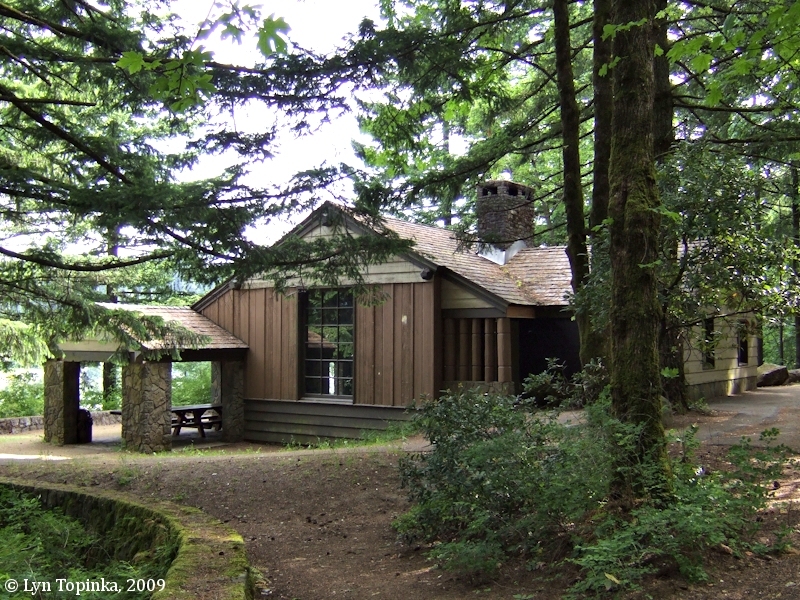 Eagle Creek was the location of the first U.S. Forest Service Campground, established in 1916. 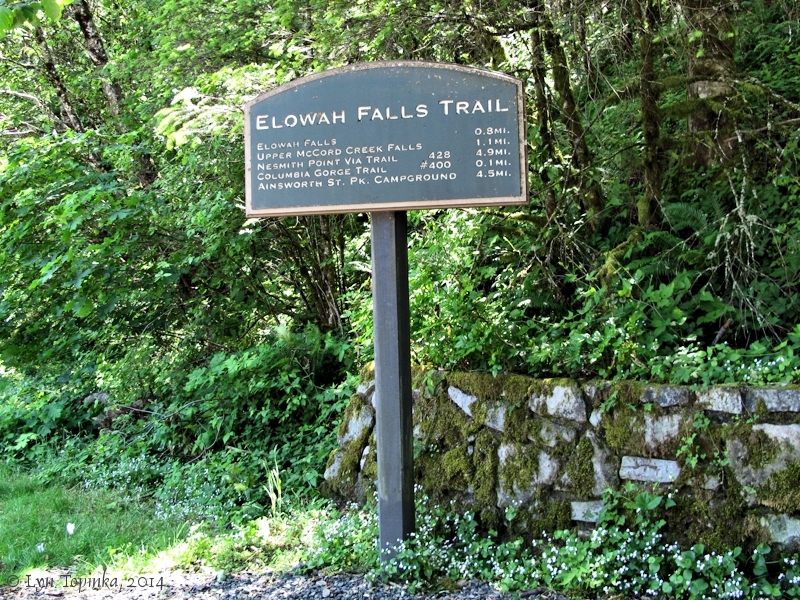 Today Eagle Creek is one of the most popular hikes in the Columbia Gorge. Located on the right bank of Eagle Creek is the Eagle Creek Fish Hatchery. The bridge crossing Eagle Creek was once part of the Historic Columbia River Highway (HCRH), and is now part of the off-ramp from Interstate 84. 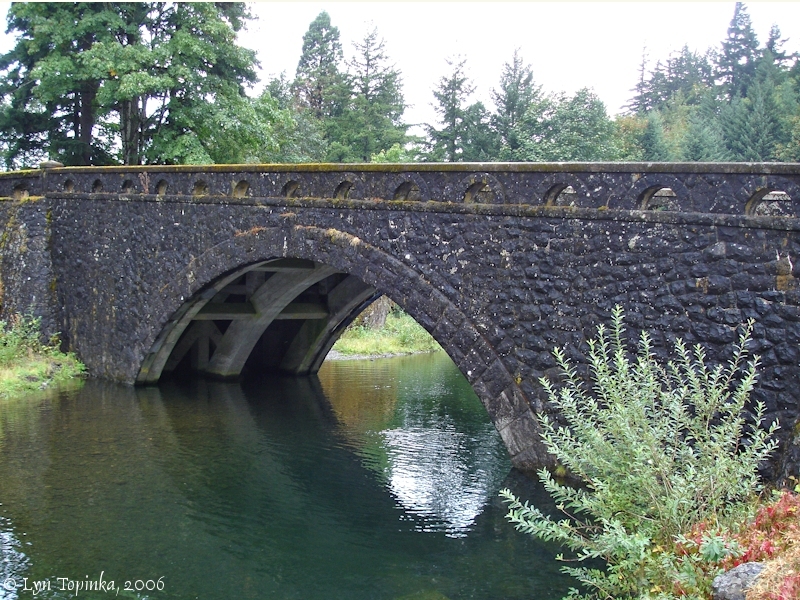 The concrete-arch bridge is the only HCRH bridge faced with stone. 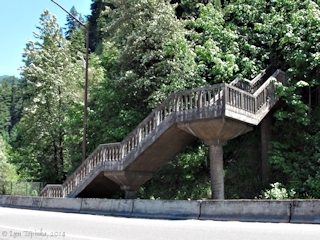 Click image to enlarge Eagle Creek Staircase, Historical Columbia River Highway State Trail, Eagle Creek, Oregon. Image taken from moving car on Interstate 84. Image taken June 9, 2014. 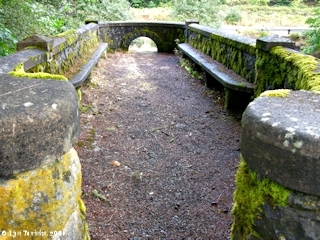 Click image to enlarge Sitting area, Eagle Creek Bridge, Oregon. Image taken September 16, 2006. "In 1915, the Oregon National Forest (by 1924 the Mount Hood National Forest) established the first improved forest campground in the United States near Eagle Creek, south and east of the CRH, as the Eagle Creek Forest Camp. It included day-use picnic facilities, good water, and sanitary conveniences. 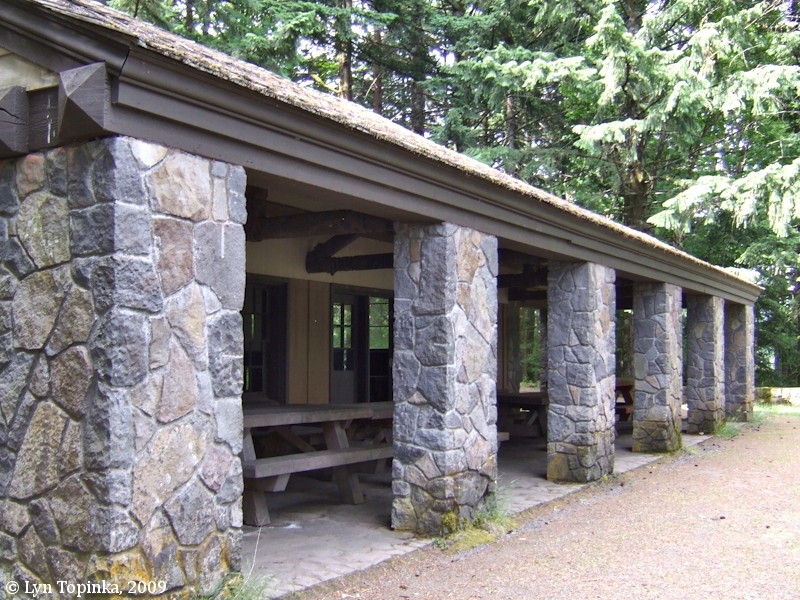 By the 1930s, the Civilian Conservation Corps (CCC) had greatly enlarged the Eagle Creek Campground, constructing several major buildings. 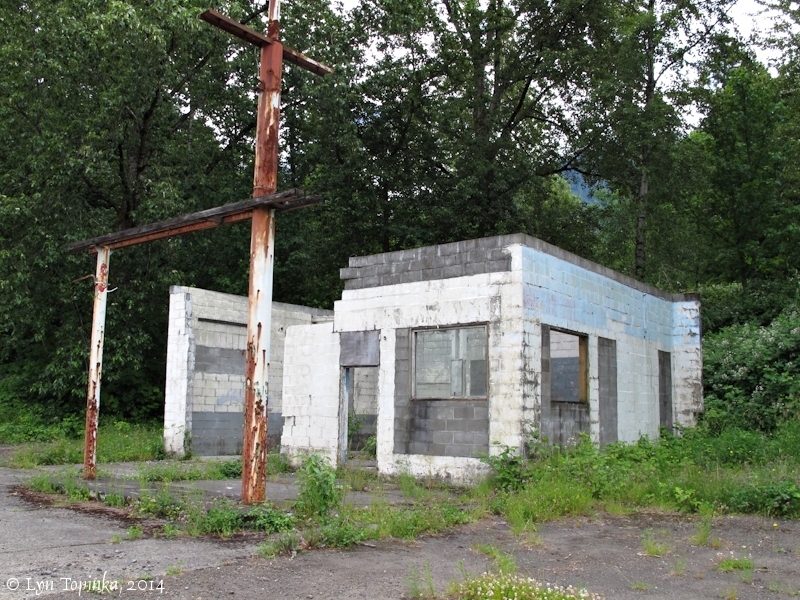 From 1915 to 1937, a privately owned campground northeast of the bridge rented cabins with attached garages. A two-story lodge offered home cooking, fishing supplies, and groceries. 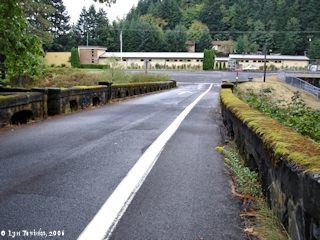 The Cascade Salmon Hatchery was constructed on this site in the 1950s. A suspension bridge constructed over Eagle Creek in 1936 to provide access to the Eagle Creek Trail was destroyed in a winter storm in 1996. 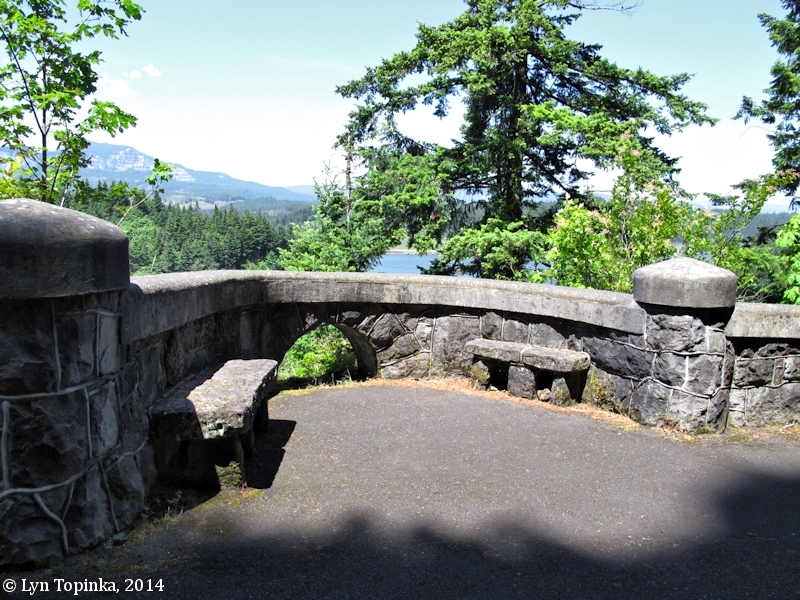 Click image to enlarge Eagle Creek Overlook, Historic Columbia River Highway, Oregon. Image taken October 22, 2015. 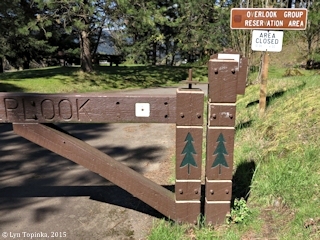 Click image to enlarge Picnic area gate, Eagle Creek Overlook, Eagle Creek, Oregon. Image taken March 30, 2015. 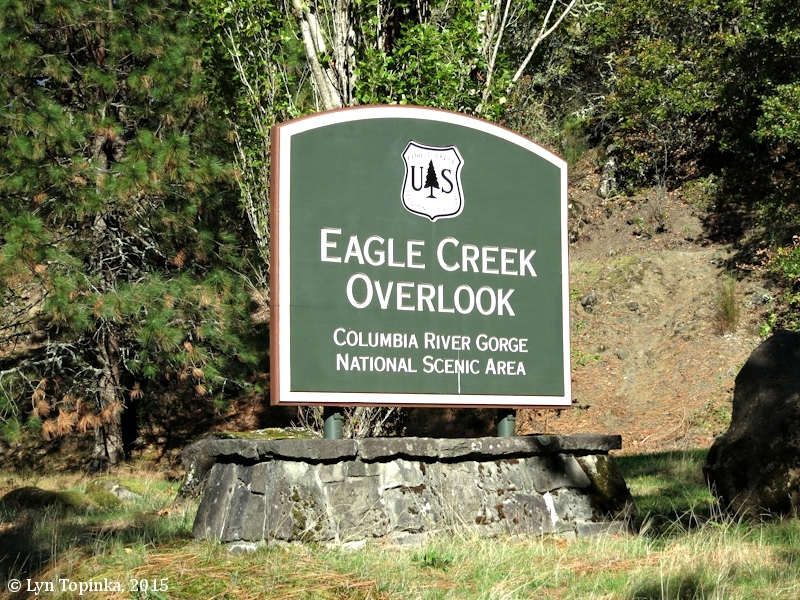 Click image to enlarge Eagle Creek Overlook Shelter, Eagle Creek, Oregon. Image taken June 3, 2009. The Cascade Fish Hatchery located on 3.8 acres on the right bank of Eagle Creek. It was built in 1959 as part of the Mitchell Act. 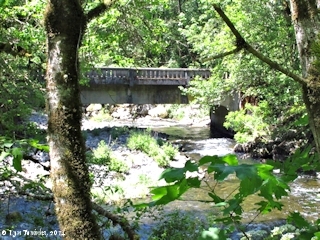 The hatchery uses the waters of Eagle Creek for egg incubation and the rearing of Coho Salmon. The location of the Cascade Fish Hatchery was once the location of a privately-owned campground with cabins, garages, and a two-story lodge. Ruckel Creek is located on the Oregon side of the Columbia River at River Mile (RM) 147, upstream of Bonneville Dam. 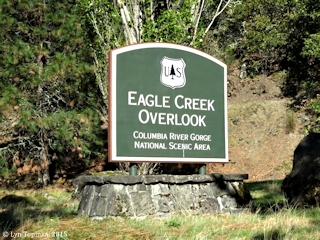 Downstream is Eagle Creek and Tanner Creek while upstream is the Oregon community of Cascade Locks. Ruckel Creek and the HCRH Ruckel Creek Bridge can be reached along the Historic Columbia River Highway State Trail. The Interstate 84 Underpass takes the Historic Columbia River Highway State Trail under Interstate 84. 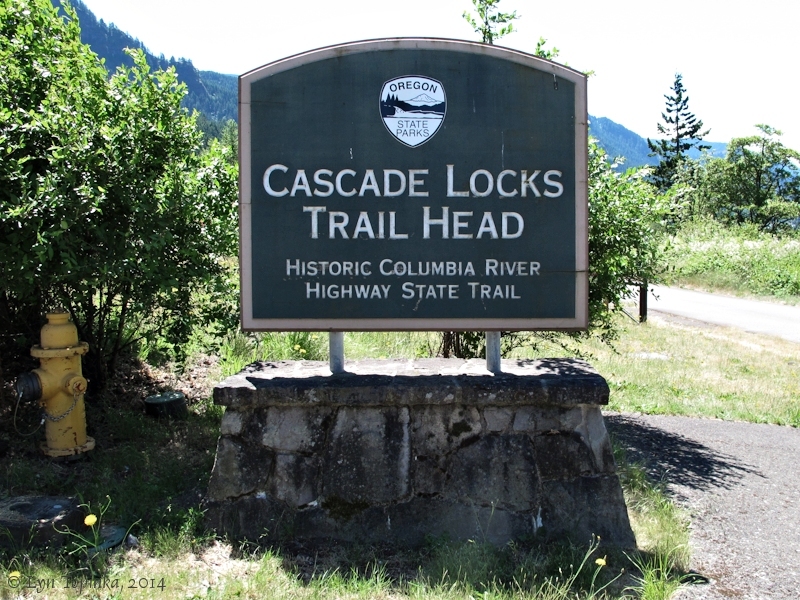 It opened in 1999, allowing hikers and bicyclists a route into Cascade Locks. 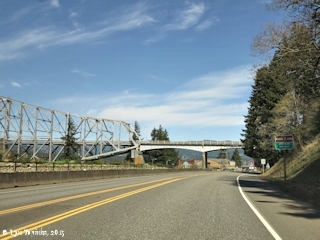 The Bridge of the Gods is located at Columbia River at River Mile (RM) 148, nearly three miles upstream of Bonneville Dam, and just downstream of the historic canal and locks at Cascade Locks. 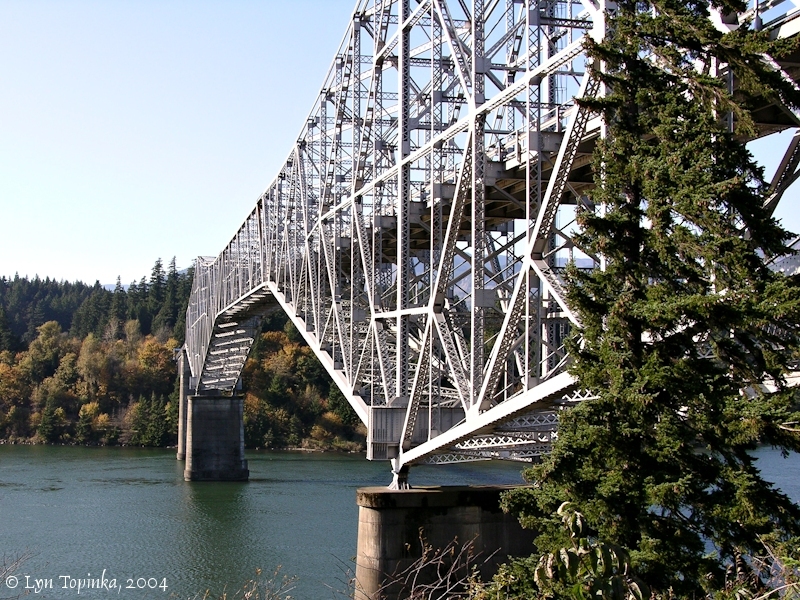 The bridge was built in 1926 and then raised in 1938 to accommodate the rising pool behind the Bonneville Dam. 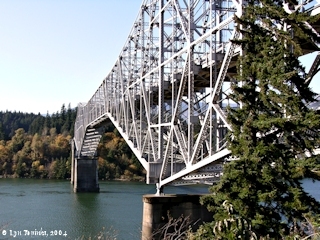 Currently the Bridge of the Gods is a toll bridge allowing motor and foot traffic, and it is the Columbia River crossing for the Pacific Crest Trail. 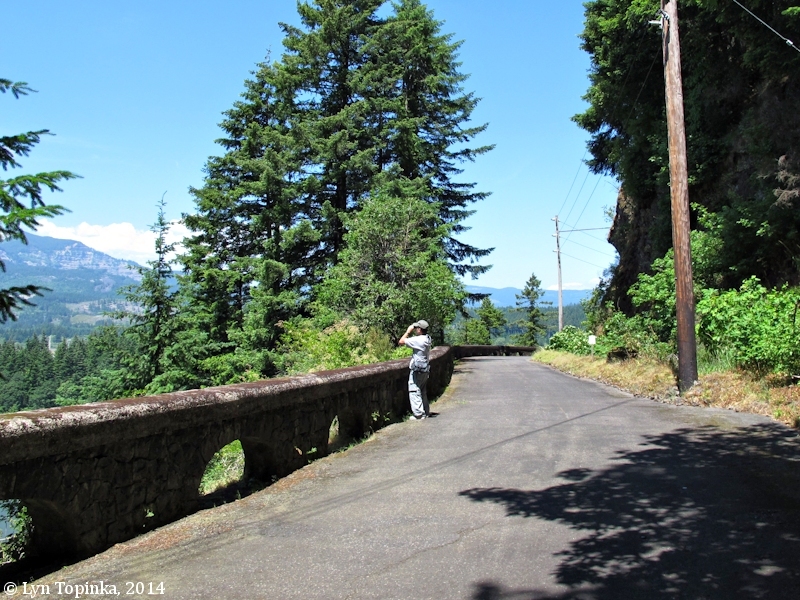 Click image to enlarge Approaching Cascade Locks, Historic Columbia River Highway, Oregon. View from west of Bridge of the Gods. Image taken March 30, 2015. Click image to enlarge Trailhead, Cascade Locks, Historic Columbia River Highway State Trail, Oregon. Image taken June 9, 2014. 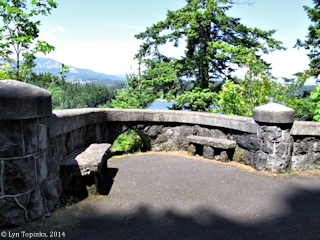 Click image to enlarge Bridge of the Gods, Cascade Locks. From the Oregon side, looking across the Columbia River at the toe of the Table Mountain Landslide. Image taken October 27, 2004. Click image to enlarge The town of Cascade Locks, as seen from the Bridge of the Gods, Oregon. View from moving car heading north across Bridge of the Gods. Image taken March 6, 2010. 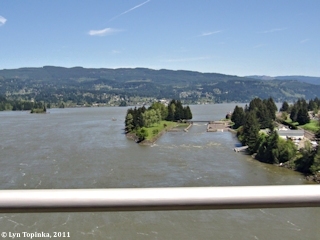 Click image to enlarge Cascade Locks as seen from Bridge of the Gods. Image taken May 20, 2011.